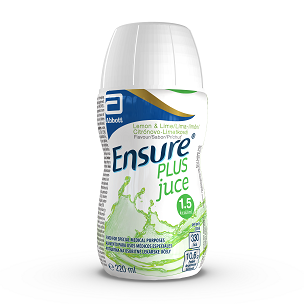 Ensure Plus juce is a 1.5 kcal/ml, ready-to-drink, juice style oral nutritional supplement for people with, or at risk of developing, disease-related malnutrition. Ensure Plus Juce is best served chilled and is available in six flavours: apple, fruit punch, lemon and lime, orange, peach and strawberry. It's presented in a 220 ml bottle with a straw for sipping and a peel-off seal for pouring. *Please note, lemon & lime flavour is not suitable for Halal diets. Strawberry is not suitable for vegetarian and Kosher diets. Ensure Plus Juce can be frozen into cubes and ice lollies. Flavours such as apple and fruit punch also taste great when warmed and served as a hot drink. They should never be boiled however, as this can destroy some of the much-needed nutrients. Ensure Plus juce can also be mixed with lemonade, fruit syrups and fruit juices.